In my house, Tex-Mex is a way of life. If I'm not sure what to make for dinner, some version of my Tex-Mex favorites are sure to come to mind. All I need to have on hand is a protein, some flour or corn tortillas, and a few of my favorite toppings (like pico de gallo, sour cream, cheese, and avocado). Before I know it, I'm planning to make tacos, fajitas, nachos, or burritos. Voila: dinner is served! While these types of foods are completely iconic today, they had to come from somewhere. Where did they come from, and what's the story behind their creation? How in the world did they become so mainstream across the United States? According to the Austin Chronicle, beef fajita history is deeply rooted in the Rio Grande Valley of Texas. As the name might indicate, Tex-Mex foods were proudly created in Texas by the Tejanos - the people of Mexican descent living in Texas in the 1800s. The cuisine created by these Texans ended up becoming the ultimate comfort food. Let's take a peek into the history of one specifically iconic Tex-Mex food by delving into beef fajita history. Fajitas literally translates to "little strap," which refers to the long, thin shape of a skirt steak. Today, skirt steak is a popular cut of meat - and the price reflects that. It wasn't always that way, though. In fact, butchers used to cut this "strap muscle" off of the cow and sell it to dog food companies for pennies on the dollar. It was a throwaway cut of meat until ranchers started to give their Mexican vaqueros (cowboys) the cut as part of their pay. And so, fajita tradition was born. These vaqueros made the best with their tough cuts by tossing them directly on the campfire. This method of flash-cooking worked well on the thin cut. Once cooked, they would thinly slice the grilled skirt steak (so they wouldn't have to chew on a thick piece of meat) and wrap them up in warm tortillas. The fajita was born, but it remained a regional dish only made by vaqueros and their families. It wasn't until very recently - 1969 - that beef fajita history began to affect modern cuisine. The Austin Chronicle tells the story of Sonny Falcon, an Austin meat manager, who opened a fajitas concession stand at the Dies y Seis celebration in September, 1969, in Kyle, Texas. Later that year, beef fajitas made another appearance in the Rio Grande Valley community of Pharr at Otilia Garza's Round-Up Restaurant. This was the first time that fajitas made an appearance at a restaurant. Garza served them up in the now traditional manner: a sizzling cast-iron platter of sliced skirt steak with a side of warm flour tortillas, guacamole, pico de gallo, and grated cheese. She wanted people to be able to build a fajita taco at the table out of the contents. Some years later, fajitas finally make it to Houston. A woman named Ninfa Rodriguez Laurenzo opened a Tex-Mex restaurant called Ninfa's in Houston. Her goal was to celebrate her Valley heritage and prominently placed dishes called "tacos al carbon" and "tacos a la Ninfa" on the menu. What were the contents of these tacos? Grilled skirt steak, thinly sliced and served on a sizzling platter: beef fajitas. Meanwhile, a German-born chef named George Weidmann was hired to open the Hyatt Regency in Austin in 1982. While beef fajitas wasn't part of his heritage, he had experienced the popular dish at roadside stands and at Tex-Mex restaurants. Weidmann wasn't intending to open a Mexican restaurant inside the Hyatt, but he did want to capitalize on the popularity of one specific Tex-Mex dish. He named them "sizzling fajitas" on the menu and used tender sirloin in lieu of the tougher skirt steak cut. After adding onions and bell peppers to the sizzling platter, and the dish was an almost overnight success. Weidmann shared his recipe with other Hyatts around the country, and just like that: they were a nationwide dish. Today, you can find fajitas on the menu of every Mexican restaurant (and many non-Tex-Mex restaurants as well). Although very few versions still capture the spirit of the campfire-grilled skirt steak, the sizzling platter is a standard in every restaurant. Fast-food restaurants like Whataburger, Taco Bell, and Arby's have gotten rid of the platter and put their own twist on fajitas. Technically, fajitas can only be made with a "little strap" of beef - but these fast-food restaurants use all kinds of meats in their versions. At home, you can easily make fajitas - either in spirit of the original beef fajita history tradition or in a new and modern way. You can find recipes for fajitas with any cut of beef, as well as chicken or shrimp. There are even vegan and vegetarian fajita recipes! All you need is a grill and some lime juice to make this West Texas original dish. 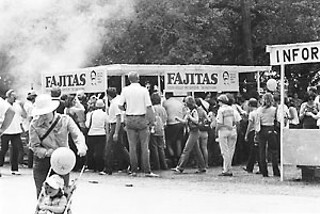 Beef fajita history is relatively new, and it has changed a lot over the last 60 years. It will certainly be interesting to see where it goes next. Will fusion food affect fajitas, creating Asian-flavored grilled skirt steak? Will tofu fajitas become the next greatest addition to Mexican restaurants everywhere? Only time will tell!